What better way to inaugurate my blog than to explain how to set up something similar? This blog uses a commonly used tool and service: Jekyll and Github Pages. "Jekyll is a simple, blog-aware, static site generator. It takes a template directory containing raw text files in various formats, runs it through a converter (like Markdown) and our Liquid renderer, and spits out a complete, ready-to-publish static website suitable for serving with your favorite web server." It is widely used by the tech-blogging community and more importantly, is extremely easy to set up with Github pages ! 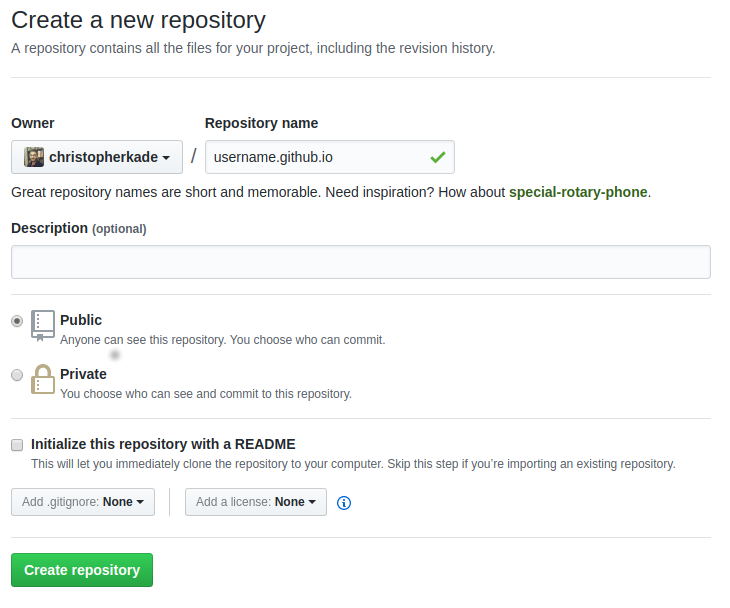 Github Pages allows any Github user to host a static website directly from a Github repository, all free of charge. The website you are currently viewing is one of them, and so is my personal website ! On this blog post we'll focus solely on the deployment of a Jekyll blog, but I might write about how to deploy an Angular4 website in the near future. And that's all you need ! Open up your browser of choice and go to https://username.github.io. All we have to do is push the contents of our Jekyll repository to our username.github.io repository. git commit -m "Initial blog commit"
And voilà ! Your Jekyll blog should be up and running, you can now start blogging at your hearts content. You can always personalize your Jekyll blog with various themes, for example, this blog uses John Otander's Pixyll theme. It might take a short while to have everything set up, but it's a rather simple process that is very similar to what you have just achieved. Don't forget to check out Jekyll's official documentation for more information on theming. Github Pages and Jekyll are two very cool free tools that should be used by anyone who wishes to set up a personal blog, website or project. There is a lot of documentation out there to help you achieve your goals, like setting up a domain and custom domain.